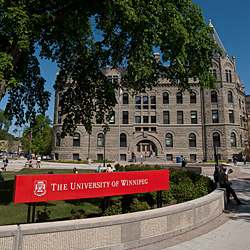 The University of Winnipeg Act, passed by the Manitoba legislature, provides that governance of the University is shared between a Board of Regents and a Senate. The Act sets out the roles, duties and powers of both governing bodies. The Board of Regents determines overall policy for the University. This includes providing the administration with strategic direction and a broad framework of goals and objectives. The Senate is responsible for the academic policy and practices of the University, faculty, staff and students. Examples of Senate responsibilities include curriculum development, setting academic standards. student appeals, and conferring of degrees. The Board of Regents meets six times per year, from September to June with an Annual General Meeting in June. Each Board meeting is divided into two halves: open session and closed session. The University community and the public are welcome to sit in on and observe the open session. Regents are volunteers and do not receive any compensation other than meals at Board and Committee meetings and fee waivers for any Board-related conferences. External Regents receive library privileges, a parking pass (upon request), and access to the Faculty & Staff Club (upon request). If an External Regent is appointed from a rural area, his or her travel expenses to and from meetings will be reimbursed. All communications for the Board should be sent to the University Secretary.